Snorkeling Hanauma Bay was how Galen got his snorkeling start, at twelve years old, on a vacation with his mother. Since then we have snorkeled it several more times in a variety of conditions. It is definitely the most visited Oahu snorkeling spot and it may be the most visited snorkeling spot in the world, with over three thousand visitors a day, over a million a year! 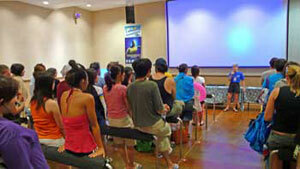 Is snorkeling Hanauma Bay worth it, given the crowds of people? 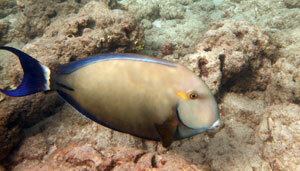 We think so if you like to see fish up close and personal. 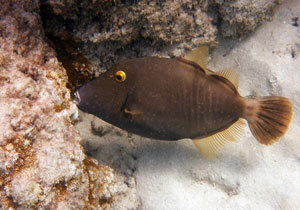 There are often many fish here, and they are so used to people that they don't swim away when you get near. This results in good photo opportunities. 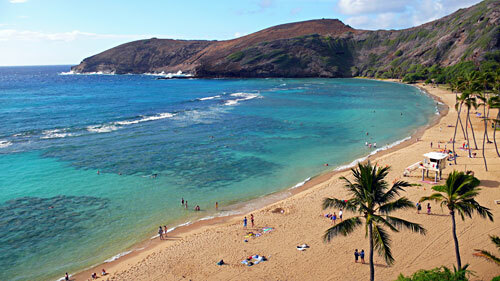 On the other hand, if you prefer to look at corals and view amazing underwater topography, then the snorkeling at Hanauma Bay is not the best choice. There are a few channels to explore but there is very little in terms of live coral. And the visibility is sometimes very low, particularly if the wind and waves are up. 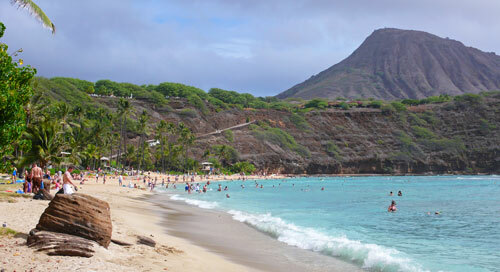 Overall, we really like Hanauma Bay with it's gorgeous turquoise waters and stunning beach. 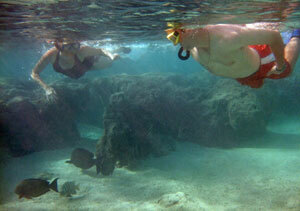 We also enjoy watching all the different people from around the world trying out snorkeling, many for the first time. Because it is so busy here, there is a lot of infrastructure involved. There is a separate fee for parking for longer than 15 minutes. If you are driving your own vehicle, plan on coming early, because the parking fills up and you could be turned away. Before you can go down to the beach to snorkel, you must pay an additional entry fee and you are required to watch an educational movie. After the movie you can either walk down the steep hillside to the water, or pay a small fee to ride the shuttle. 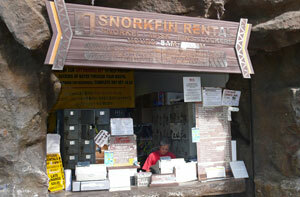 Once at the beach you can rent snorkel equipment. It is very convenient but a little pricey. You can save some money by renting it in the city before you drive to the bay. We prefer to get here very early in the morning, before 7 a.m., to ensure our parking spot, to avoid the bulk of the crowd, to see the most fish in the early morning hours, and to possibly catch a time of lower winds. 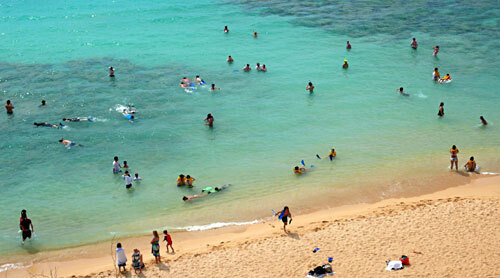 There is more information about snorkeling Hanauma Bay on this official park website. Look at the beach and water with your polarized sunglasses before you walk or ride down the hill. You will notice that the reef comes almost to the beach in many places, so the entry is better from the areas where the sand goes out a ways. There are two channels in the reef where the currents can be strong because the water in them exits into the open water of the bay, so be very careful if you choose one of these as your entry. 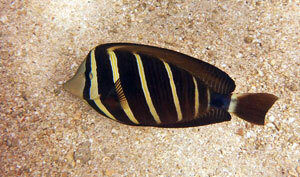 Walk out in a sandy area and when the water is deep enough, slip your fins on. Snorkeling Hanauma Bay is possible along almost the entire length of the beach, but some of it only if the tide is high and the waves are calm. Nearly the entire stretch of beach is protected by a barrier reef. The two channels where water exits the beach area back to the larger bay are the exceptions. One is just to the right of the middle of the beach and the other is on the far left side. These channels can have strong currents and unless it is a calm day or you are a very confident swimmer, don't explore them. 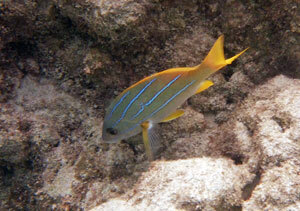 Most people stay behind this reef in the protected shallow waters, making it a fairly safe snorkeling spot. 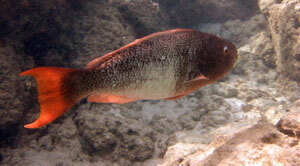 In snorkeling Hanauma Bay, you are swimming around and sometimes over a flat reef that is primarily covered in algae. There are a few bits of live coral here and there, but mostly you are here for the fish that live in the reef, and you might get lucky and see a turtle. You can get in at one end of the beach and swimming in and out of the reef, snorkel down to the other end of the beach, exit and walk back. The visibility does get low when the wind and waves are up because the sand gets kicked up. The depths through most of the inner reef range from 2 to 8 feet. We have read accounts of folks swimming out one of the channels to snorkel the outer reef edge. It has not been calm enough for us to ever attempt it. But if you are an experienced snorkeler, the wind and waves are down, and the currents in the channel are not overly strong, you might attempt it yourself. We have heard that the outer coral reef is alive and interesting. 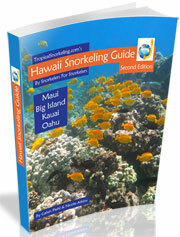 If you plan to visit more than one Hawaiian island, take our Hawaii Snorkeling Guide eBook with you. 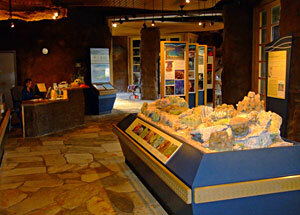 It contains a map and many more pictures of Hanauma Bay and other Oahu locations too. 1. Get on Ala Wai Blvd. heading northwest (one-way only in that direction) and follow it to McCully Street and turn right. 2. Go to the next intersection, with Kapiolani Blvd., and turn right again. 3. Follow Kapiolani Blvd. until you see the signs to get on H-1 East and do so. 4. Continue on H-1 East for about 9 miles noticing when H-1 changes into Hwy 72 (Kalanianaole Hwy). The road will cross over water and climb a hill, and at about the top of the hill you will see signs and a turn to the right to enter the park. Follow the road downhill to the parking lot. 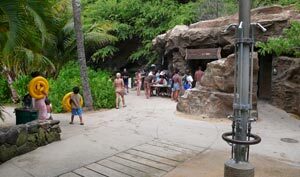 There are many facilities available here including ecologist education booths and signs, snorkel gear rental, lifeguards, restrooms, water, picnic tables, showers, and shade. There is also a concession stand up on the hill with grill foods.